Sunday was sunny and beautiful but oh so cold and I regretted not running with gloves on. By the end of the race I could barely feel my hands and my fingers were swollen. I rushed to grab my bag after queuing for 20 minutes to get back in to the runner’s village. I added on as many layers as I had with me and left for the station to get back to Bristol. I was halfway through getting away from Bath as soon as possible when I realised that I had just had an amazing two hours and twenty-three minutes. The bubbling enthusiasm with which I had woken up was back and I was smiling away to myself as I began to enjoy the walk. I’d only been to Bath once before but that was five years ago and it was a brief lunch and drinks with family friends. I needn’t have worried about getting to the runner’s village as I only needed to follow the crowd and that didn’t require much thought. Lots of people in pairs and groups, giggling and joviality. Lots of couples with their arms around each other, groups of middle aged women with pockets and gels and bananas and bottles of lucozades. Brand new, clean, trainers and bright clothing but not for long. My trainers were looking grimy anyway but the mud was not very pleasant and great clumps of it kept making its presence known all the way past the starting line. Having the Garmin 405 gave me a satisfying pseudo sense of control since I could check my lap time, distance run and time run all on the same display. The main thing that kept me going however was the fact that I had enough energy and my muscles were more than ready to keep going for the whole 13 miles. I had run the Bristol half in 2:20 so I thought I would stick to that pace and kept my laps between 6:45 and 6:55 a km. The first 5km was more of a test to see how I felt and how the time would pass by. Then I aimed for 11kms because that would be over half-way and once I’d done that I would know if I could do the same to finish with. 16km was my next goal because after that there was only 5km left and I definitely knew I could run that. At the Bristol half-marathon there were some quite amusing little moments such as the girl at six miles who was strolling along while chatting on her phone and the woman on the sidelines around the Welsh Back who called out ‘come on, you can do it, this is the easy part’ (!). At the Bath run, the most amusing part was a couple briefly separating so he could use the toilet and the girlfriend saying ‘good luck and I love you’ just before blowing him a kiss. Very war like. I hope they found each other again. Other memorable moments were the band at the start to Queen Square, the house which had the Killers’ Mr Brightside playing at the same point both times I passed it (It started out with a kiss, how did it end up like this), the Heart radio stand with Abba and Ronan Keating, and as usual my favourite part of the race is the little kids and the animals who don’t know why they’re there but are just having a good time. My knee took a while to start aching but once the discomfort arrived at around 8km, it stayed until the end. The feeling wasn’t so bad that I had to change my running style at all so I kept going. I did pick up a lucozade bottle during the first lap rather than the second one as I had intended and it was lucky that I did. The drinks had run out the second time around and when questioned one of the volunteers said there’s a water station if you keep going (if?). The end of the race was quite a depressing sight with hundreds of barely drunk, and probably some unopened, bottles lying by the side of the road. I held on to my water and lucozade bottles until they finished. Past the finish line and towards the collection point there was quite a jarring moment when everyone just stopped moving. There was nowhere to go and the post-run warmth quickly faded away. There were enough ambulances going by to make me appreciate that I did ok. My knee’s a bit painful right now and it was a lot worse cycling back from the station after the race but it will get better. The next race is the London Marathon and after taking a look at some photos already published I realised I need to work on my tan. I shall add it on to my training regime! 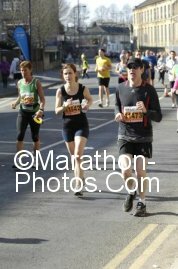 This entry was posted in Running and tagged Bath Half Marathon, cold, Running. Bookmark the permalink.